Sen. Jim Inhofe (R-Okla), senior member of the Senate Armed Forces Committee, visited deployed members of the 45th Infantry Brigade Combat Team, Oklahoma Army National Guard at the combat training center on the International Peacekeeping and Security Center near Yavoriv, Ukraine on March 17, 2017. The Thunderbirds are deployed in support of Joint Multinational Training Group-Ukraine. 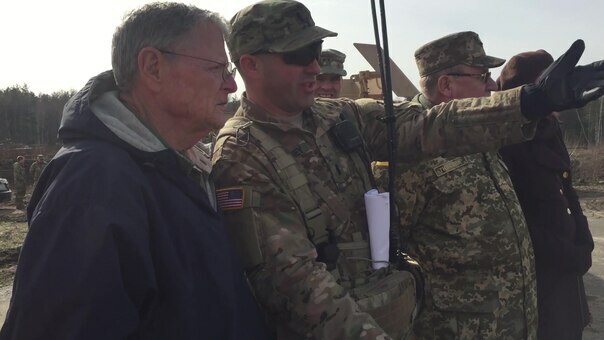 This work, Senator Jim Inhofe Visits Deployed Oklahoma Guardsmen, by CPT Kayla Christopher, identified by DVIDS, must comply with the restrictions shown on https://www.dvidshub.net/about/copyright.